Luke has never been very adventurous in physical activities. He doesn't do any reckless climbing, jumping, swinging, or anything of that sort. The child still claims that he cannot climb out of a pack'n'play. Don't get me wrong - I like my kids to be tad cautious. For example, Luke would be terrified to walk through a parking lot without holding my hand, and frankly, I am thrilled about that! Your little brother can do it. Ah, what a precious phrase. Sibling rivalry? No, I am not afraid to promote it. On the contrary, I welcome it. I am going to milk the heck out of it! Isn't that what having two boys is all about? Okay let's be clear here, Judah cannot walk down the stairs. If that was true you'd have seen him on Good Morning America by now. But he is getting really good and crawling up and down the stairs. I mean REALLY good. I've watched him do it about 30 times now without a single fall. He seems too young to be given free stair access, but... maybe it's time? How many times does a mama have to watch her baby in action before she admits that he's ready? Anyway, his little brother's success was enough to encourage Luke to be adventurous, too. 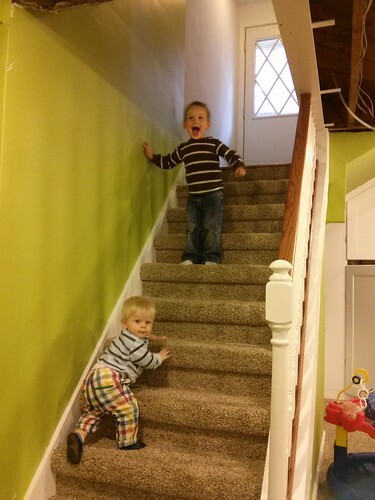 Here are my two boys, practicing their new stair-mastering skills. My dear, cautious Luke - maybe there's hope for you yet!